When we bind two WPF objects the target data is updated depending on the "UpdateSourceTrigger" events. The "UpdateSourceTrigger" has events like lostfocus , property change etc. In other words when lostfocus or property change event happen on the target it makes a PULL to the source to get the latest data. So it's very much possible that the WPF source data has changed and because the WPF target "UpdateSourceTrigger" event did not fire he did not make a pull and the data of the source is not in synch with the target. This is where "INotifyPropertyChanged" interface comes to use. Below is a simple "clsCounter" class which has a "Counter" property and this property is incremented by "Increment" method. Now if we bind WPF label or textbox to the "Counter" property and call the "Increment" method the new "Counter" value will not be propagated to the target. Because invoking a method does not trigger any "UpdateSourceTrigger" event. So after calling the "Increment" method the "Counter" value of the source and the target are out of synch. So create a push event from the source you need to first implement "INotifyPropertyChanged" interface as shown in the below figure. 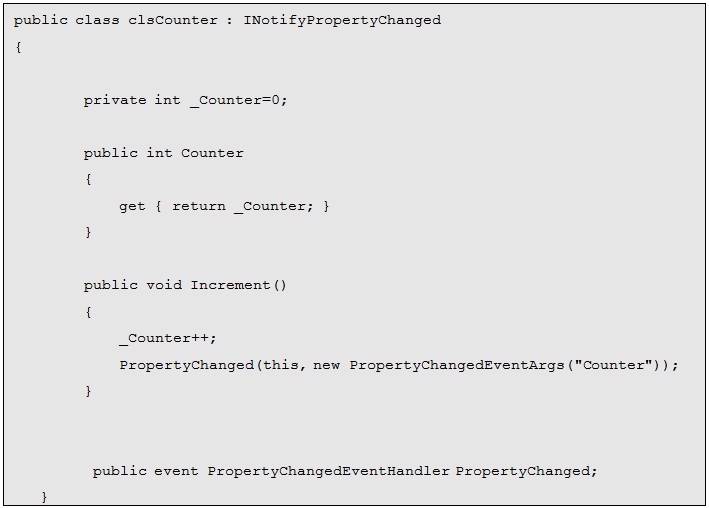 Now when someone calls the "Increment" method you can raise an event saying that the "Counter" property has changed by calling "PropertyChanged" function as shown in the below code. Below is full "clsCounter" class code with "INotifyPropertyChanged" implemented.